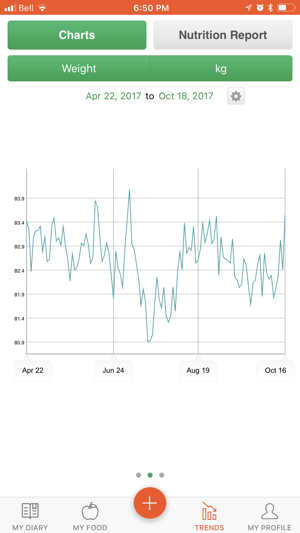 Cronometer can be used for free, but it also has optional in-app subscriptions to our Gold tier of service which offers an ad-free experience along with additional features. The Gold subscriptions purchased here will be charged to your iTunes account. By default, your subscription will auto-renew on a Monthly ($5.99 USD), Biannual ($24.99 USD), or Annual ($34.99 USD) term as per on your selection. You can change or cancel your subscription renewal under the iTunes Account settings. Your subscription will auto-renew on schedule unless you cancel with at least 24 hours prior to the renewal date. Was loving it until *UPDATE!! It works again!! NEW UPDATE: I ended up emailing the support staff about the issue I was having and one of their people was in constant contact with me until the developers were able to fix the issue. My Polar Fitness Band is now back to syncing with the app, and my activity data (i.e. calories burned) are showing up in the app again! I’m back to losing weight!! Thank you so much, Developers and Support Staff!!! The app all of a sudden stopped working with my Polar Fitness Band five days ago. Now, my activity data (i.e. calories burned) won’t sync with the app anymore. I’ve tried everything. I unlinked/re-linked my Polar Band with the app. I’ve logged out and back in after changing the settings. I uninstalled the app and reinstalled it. Now, any time I try to link my band with the app, I get an Error message, and the app gets stuck on a page that says “Connecting Device” with a little circle going round and round like it’s “loading.” To get out of that screen, I have to exit out of the app, and when I go back in to the “Connect Device” page, it says my Polar Band is linked- even though it’s not! Been dealing with the for 5 days now. Very frustrating. 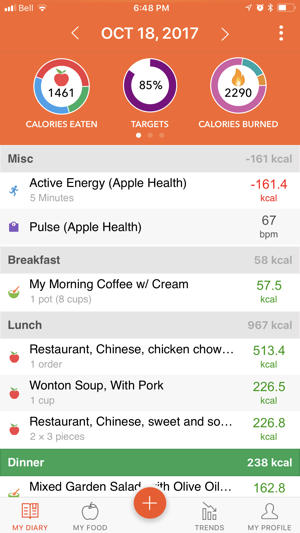 The app is only useful for me to guide as a weight loss tool if I know the correct amount of calories I am burning, and thus what a true 500 calorie deficit is, so that I can aim for a one pound a week loss. Please fix!! Otherwise, would be 5 stars!! 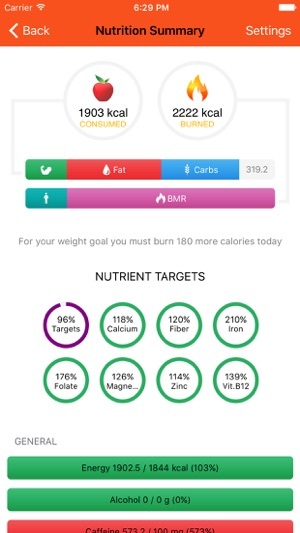 This app has tons of nutrient tracking, macro customization, etc etc. It’s not perfectly streamlined yet - I wish it would remember my quantity choices - but I find the wealth of options ( and the $5.99 subscription price) worth an extra click or two for some things. The learning curve for detailed tracking is a bit more involved, but it yields better data than I’ve ever had. I think I can streamline it more by taking advantage of custom foods. That said, I can see my macros for the day the second I open the app - along with tons of other information - much easier than any other app I’ve used. 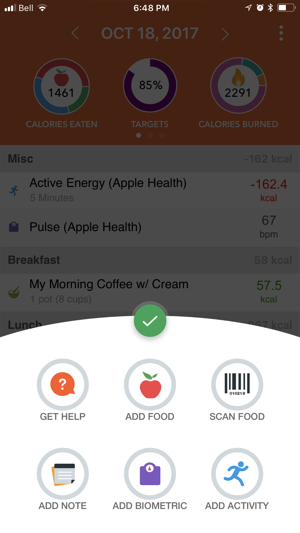 Also the “oracle” feature is really fantastic, to help me identify the foods that will be best for me to eat. There is also good information and support on how to track YOUR nutrients, and how to get the best nutritional data, including how your fitness tracker will affect your results. Looking forward to thoughtful improvements. I feel like I have complete control over my food choices with fewer mysteries, and I trust the data. Thank you!! I use both the app and desktop page and have found it took almost all the guess work out of the keto diet. I have found it's default guidelines to be comfortable for me, and my favorite thing is getting a close look at what I'm missing nutritionally. I suspect a few deficiencies in my diet and after tracking my habits I was sure what to supplement and what to eat more of. It's a good overall look at daily habits and trends and very very helpful for keto. I trust Dr. Mercola on many health topics so this almost feels like he's personally coaching me, because I trust that he had his developers use a well thought approach to the calculations involved with this. I have no complaints about finding product or inputting info. I don't expect perfection, it's a constantly changing market. I have been pleasantly surprised that many name brands I use are there. I find this app much more helpful and informative than my fitness pal. It's more personalized. © 2011 Cronometer Software Inc.